Home » Culture » Art & Craft » Fashion Trend: Indian Embroidery is back! 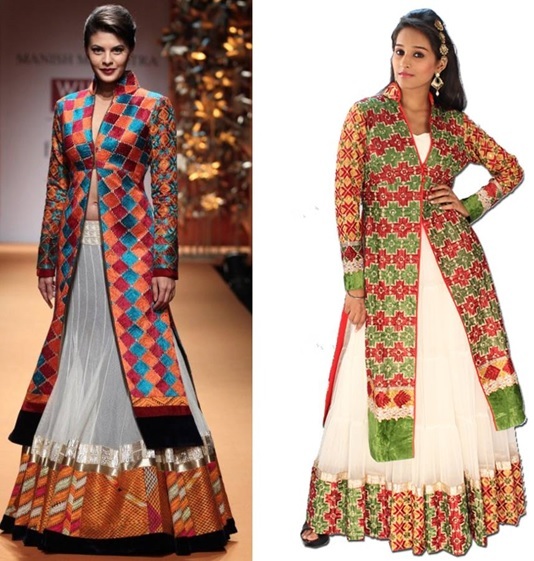 Fashion Trend: Indian Embroidery is back! Traditional Embroidery is making a comeback in Indian Fashion. There is a raising trend in Indian embroidery clothing. Ladies especially are fond of embroidery designs – on salwar, bridal-ware, sarees, dupatta, lehenga, hand bags, slippers etc. 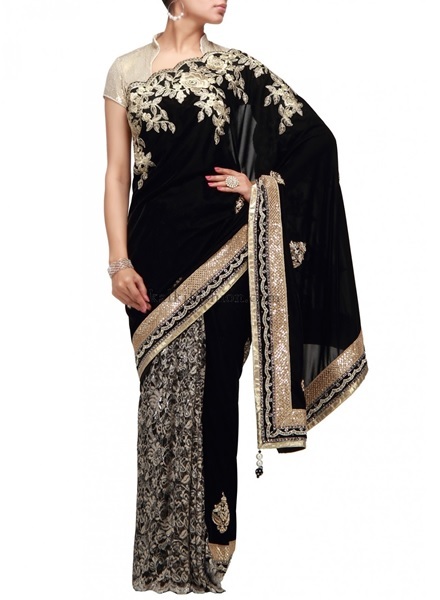 Based on where designs are originated in India there are several varieties of embroideries. The hand oven thread designs are really beautiful and very artistic. Kashmiri embroidery is fine work executed on cotton as well as synthetic fabric. The thread used is from fine wool of the pashmina goats, handspun by the old ladies of the village. Dress materials, shawls, covers, bags are all exquisitely decorated with fine hand embroidery mostly using chain and satin stitches for filling up the motifs. The designs are usually flowers, leaves and other inspiration drawn from nature. Bead embroidery is technique for adding beads to fabric using traditional embroidery stitches. Beads can be used as embellishments on an incredible array of items from garments to shoes to home decor.Beaded enhancements can be added to fabrics in garments, accessories and decorative items to create unique handcrafted pieces. Bead embroidery can be an easy way to make store-bought clothing and accessories unique and personalized. In India particularly in Agra one will see dazzling bright purses and bags with beautiful zari and bead work have been executed by the artisans from Agra. The work is done using madeira, kora (thread), gijai (springs), dapka (shiny thread), ari work. Worked by the peasant women of Pujab, Phulkari odhanis or shawls are intricately woven into the cultural life of the high-spirited, hard working people of the region. They form an important part of the bridal dress, are given away as dowry and worn on all festive occasions. Even in death, a married woman’s bier is covered by finely worked Phulkari. 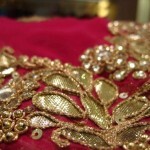 The base of the embroidery is hand spun, hand-woven khaddar, generally in shades of red. The unique feature of the craft is that it involves the use of only one stitch – the simple darn. The stitches are worked on the wrong side of the cloth with silk thread called ‘pat’ in Punjabi, to produce a smooth silken sheen on the surface. Chikan work traditionally done on muslin is now done on a variety of semi transparent synthetic fabrics. The stitches used are back stitch, herringbone. The stitches are made on the traced pattern on the reverse side. The herringbone filled on the reverse appears as a shadow work with a thin outline on the right side. This work is now done on a variety of materials in all color combinations. Crochet embroidery designs are done by using thread and yarn. The crochet lace knitted thus can be either directly attached to the fabric, or worked into the border of a salwar, duppatta, blouse and sari. The craftsmen involved in kasuti embroidery of Karnataka, have no recourse to external aids like tracing the design and build the motifs even as he is working the stitches. 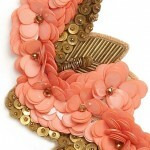 Design depends on the texture of the cloth, as working the embroidery involves the counting of threads. Four distinct stitches are practiced in the craft: the ‘gavnti’ or double running stitch, the ‘murgai’ or zigzag running stitch, the ‘negi’ or ordinary running stitch and the ‘menthi’ or cross stitch. Kasuti, which flourished in Chalukya and Vijayanagar kingdoms of the 15th and 16th centuries, is rich in symbolic motifs of court life and temple ceremonials. Traditionally, the needle work is done by the women of the region for their personal use, on hand-woven saris. ‘Irkali’ saris as they are called are woven with 9-10 inches of warp thread left loose at the palla end. The craftsmen uses these extra threads to work the embroidery, the colours for the work being taken from the base itself. The total effect, when complete, though rich, is very beautiful and subtle. The todas, a pastoral tribe who inhabit the Nilgiris or Blue mountain of Tamilnadu are believed to many to be of Greek origin. 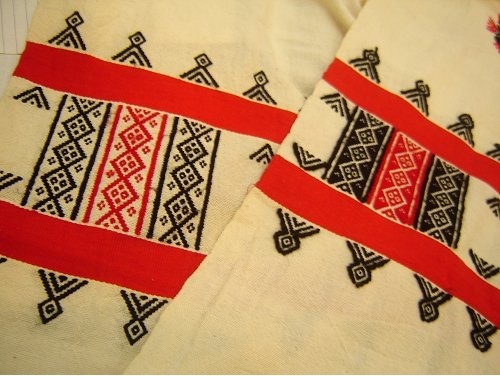 Toda women embroider the ‘poothkulli’ or long wrap worn in Greek fashion by both men and women of the tribe. The base material, normally white in color, is hand woven in single width and the embroidery is done by counting of threads. Wide bands in red and black are woven at the end of the 9 yard long ‘poothkulli’. The omen embroider in between these bands creating a striking ‘pallav’. The embroidery is worked on the reverse of the cloth to produce a rich, embossed effect on the surface. Originated in Gujarat Kutch embroidery is popular with youngsters. 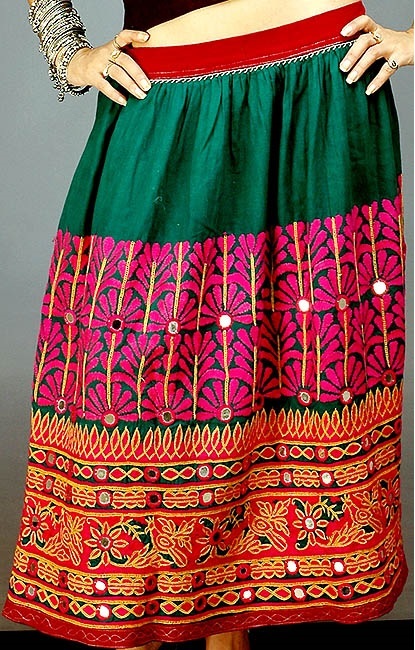 Kutch embroidery is considered one of the most colorful and lively embroidery as it used a riot of colors. Done using different color threads and mirrors, it is best teamed with any plain fabric to draw out the best in the fabric.